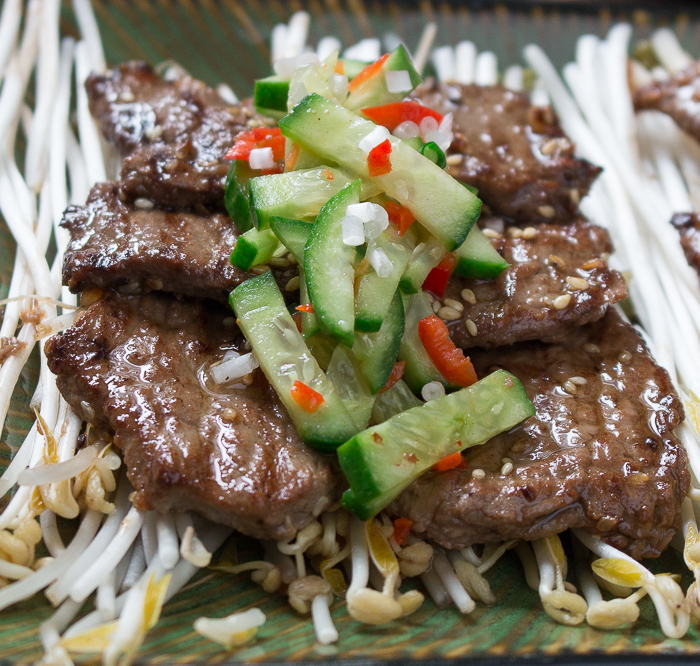 Korean Beef BBQ Kalbi recipe has tender melt in your mouth boneless short rib seared over the grill, dunked in a spicy gochuang, soy and sesame dipping sauce and served with a side of quick pickles. Have you ever been to a Korean BBQ restaurant? Don't you just love all the delicious pickles, delicious cuts of beef and veggies to grill. I love my grilled Korean Beef BBQ Kalbi drizzled with a little spicy sauce and rolled up in a lettuce leaf. Unless you have an extravagant dining room table with a pop up grill in the middle you need to simplify this whole process down to a family meal but with some delicious traditional Korean flavours. The best part of enjoying a Korean Beef BBQ Kalbi, it is like an instant party. Everyone loves assembling their own food and sharing it at a table together. In addition, all of the items can be prepared in advance of your party and gathering and all you need to do is grill your marinated boneless short ribs for just 1-2 minutes. I don't have one of those fancy pop up grills in the middle of my dining room table either so I either grill outdoors or when I am lazy I grill on my grill pan indoors. It is around this time of the year that I cannot not wait for flip-flop season. I am sick and tired of weeks and weeks of fog, smog and dampness in Hong Kong and can't wait to see the sun again. Are you sick of snow, sleet and mother nature? 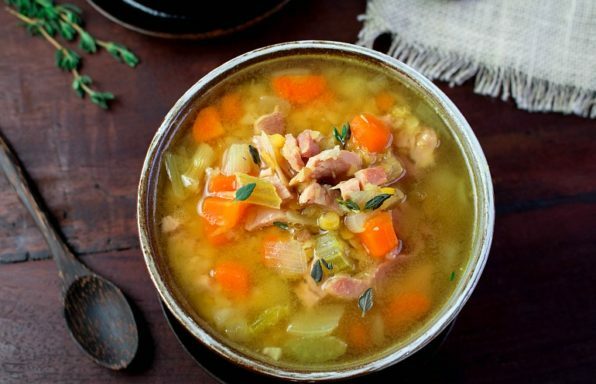 If you want to be ready for the spring/summer, we need to start thinking about lightning up our meals but still keeping all the flavours. 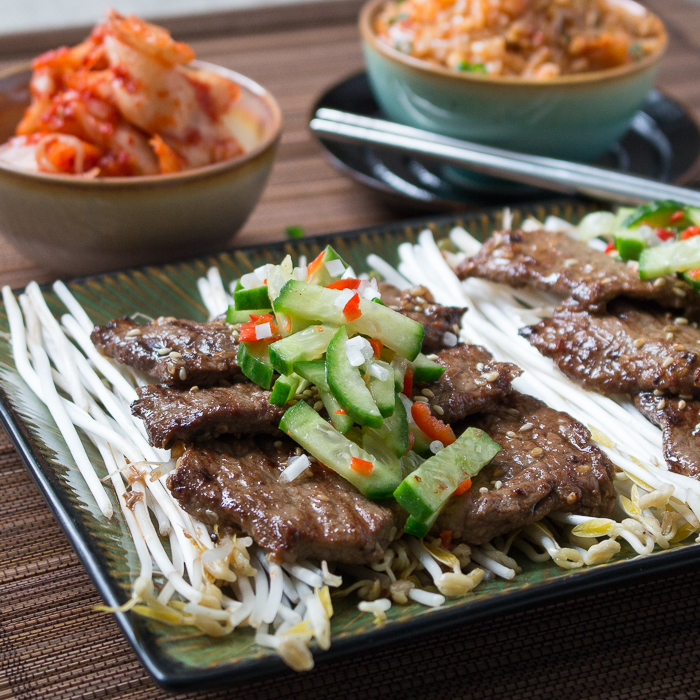 This delicious Korean Beef BBQ Kalbi is sure to deliver with all of its delightful spices and textures. 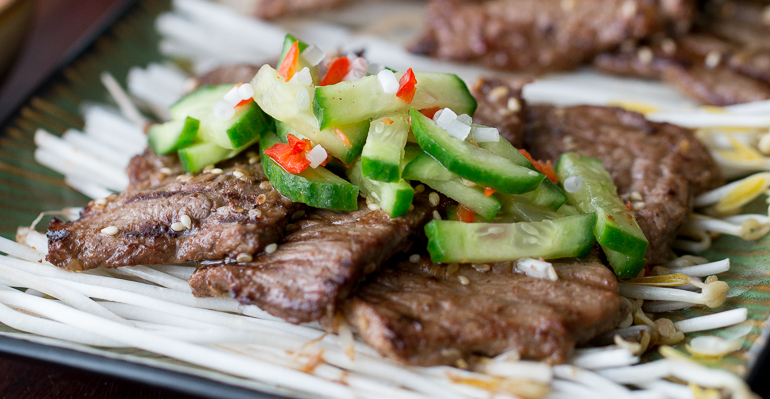 Korean Beef BBQ Kalbi is a great low carb meal and diabetic friendly if you use a sugar alternative in the quick pickles recipe. If you are vegan, just replace the beef with hearty Portobello mushrooms. If you want to keep this recipe gluten-free, use tamari sauce and use gluten-free gochuang sauce. Korean Beef BBQ kalbi, sometimes also called galbi, all starts with the cut of beef and the special marinade. I used beef short ribs without the bones for this recipe but it is really your choice and you can use a rib eye, strip loin or tougher cuts of meat if you marinade the beef overnight. 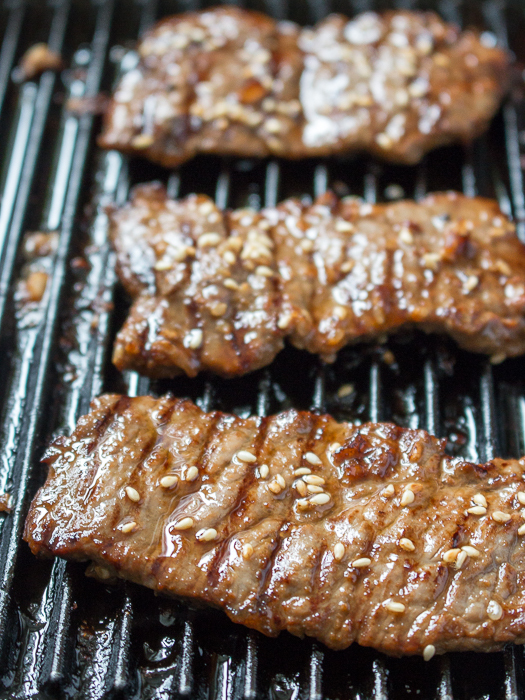 I know some of you may be asking what is the difference between Kalbi and Bulgogi? It is the type of beef and how it is cut. Usually, kalbi is made from short ribs either with or without the bones and it is cut somewhere around 1/4 inch thick. 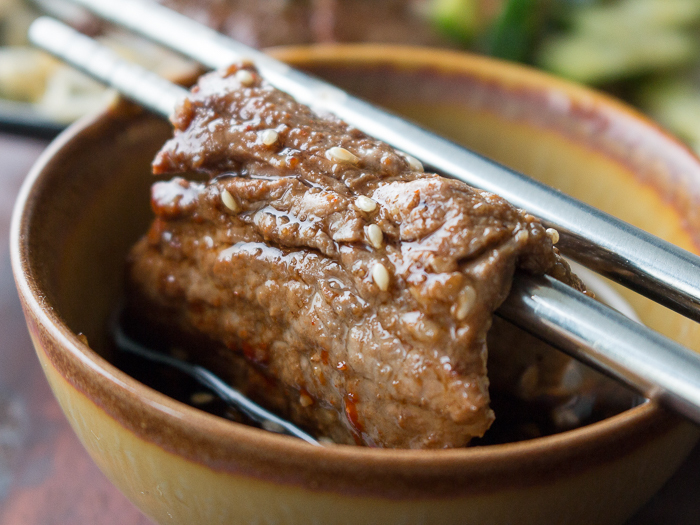 Bulgogi can be cut from really tender cuts of beef like tenderloin or rib eye or other cuts of meat and it is cut super paper-thin. My marinade is much like the usual marinade but healthier. Many of my Korean friends use a sprite or lemon/lime soda pop or brown sugar in the marinade but my version only uses kiwi fruit to sweeten the marinade along with tamari (soy) sauce, sesame oil, onions, white pepper and of course lots of garlic. You can exchange the kiwi fruit with a grated Asian pear and that is also very nice. Grilling over the hot coals, outside gas grill or even on your inside grill pan all work well. You only need to quickly sear the meat about 1 minute on each side and it is done. You have to love that. Dunk your masterpiece into the delicious gochuang, soy and sesame dipping sauce for a lip smacking delicious treat. Gochuang is a delicious Korean fermented chili paste and if you cannot find that near you exchange with a little Siracha sauce. 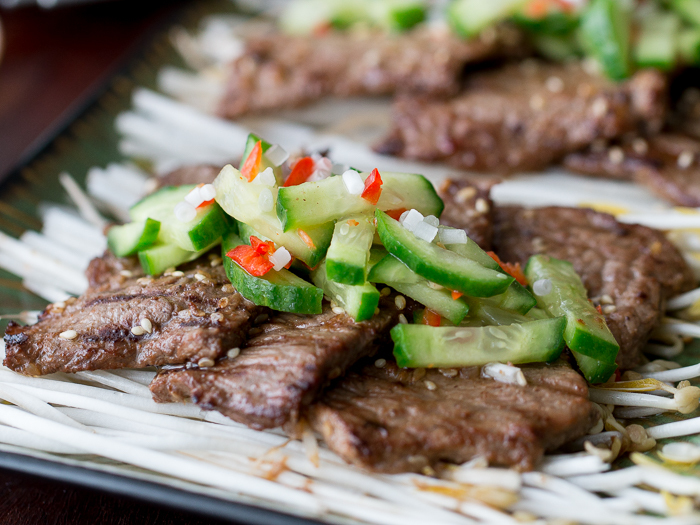 Man cannot live on meat alone and that is why I like to accompany Korean Beef BBQ kalbi with a quick pickle. I like to use the tiny skinny Asian cucumbers but you could use other types as well. If your pickle has lots of seeds, you are going to want to remove those before you dunk them in the pickling juice. There is no heating up vinegar or fussing. Just splash a little rice vinegar, salt, coconut sugar or sugar alternative, sesame oil and of course fresh chilis and toss and let stand for about 15 minutes at room temperature and these delicious quick pickles are ready to be served. These are not like regular pickles and are best eaten within 24 hours but can be kept up to 3 days in a sealed container in the refrigerator. 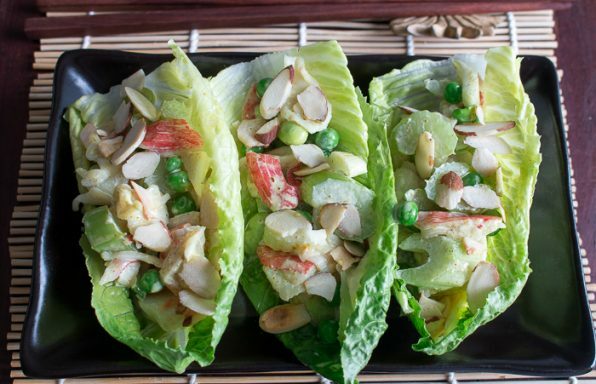 If you want to set up a full Korean Beef BBQ Kalbi, then some of the fun side dishes are lettuces to wrap up your beef in and then loads of your favorite toppings. You may like to include special spicy gochuang, soy and sesame dipping sauce, kimchi, quick pickles, bean sprouts, marinated or grilled garlic cloves, sesame seeds or whatever your little heart desires. In addition, today I needed to fill up my boys and also made a side of Kimchi Pantry Fried Brown Rice too. 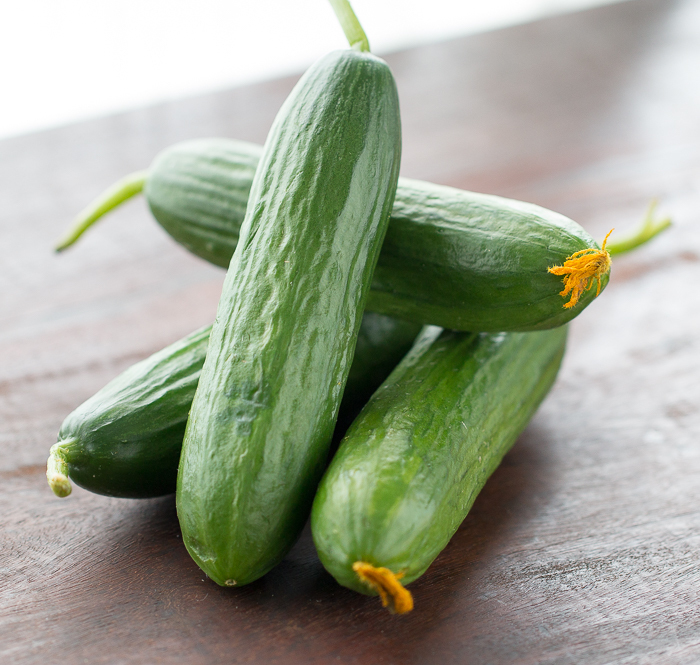 cucumbers - 4 small skinny Asian Cucumbers or obtain the kind without seeds or remove the seeds before slicing. 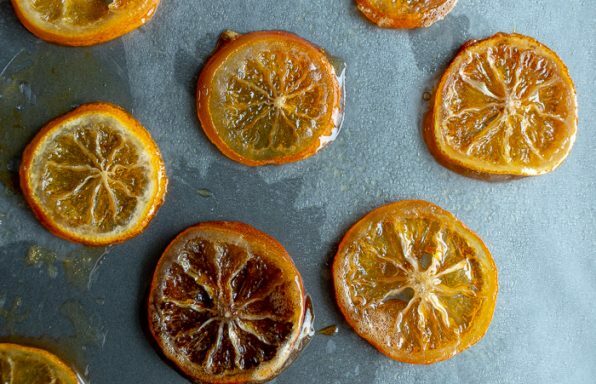 Cut into thin slices leave the skin on. gochuang sauce - 1 tablespoon or to taste (very spicy) - I found a gluten-free and vegan GoChuang Sauce from Chung Jung One. 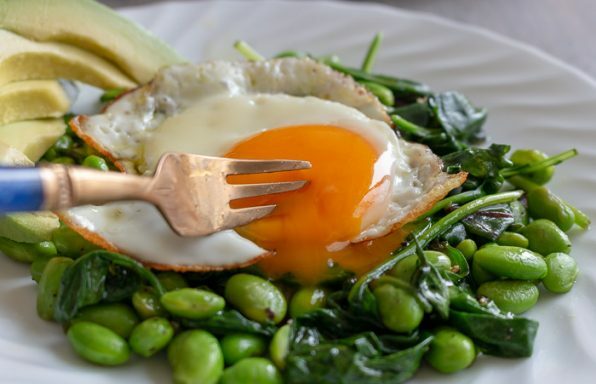 olive oil - 1 tablespoon if using indoor grilling pan and if grilling outdoors prepare your grill. 1Marinate your boneless short ribs. In a plastic bag or plastic container add short ribs, kiwi, tamari (soy) sauce, sesame oil, garlic, onion, sesame seeds and white pepper mix and seal bag or container. Place your short ribs in the refrigerator overnight to marinade or at least 4 hours. The longer the marinade time the more tender the beef. 2Step 2) Make your quick pickles. 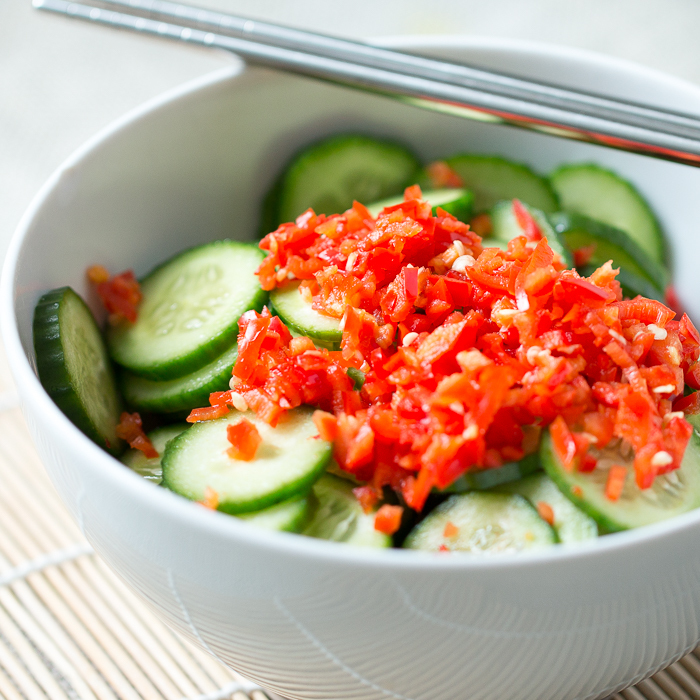 (optional) In a medium bowl, add your sliced cucumbers, chili peppers, rice vinegar, sesame oil, salt, sugar or sugar alternative of choice and white pepper. Stir until well mixed and set aside at room temperature for 15 minutes and then they are ready to eat. Consume within 24 hours. 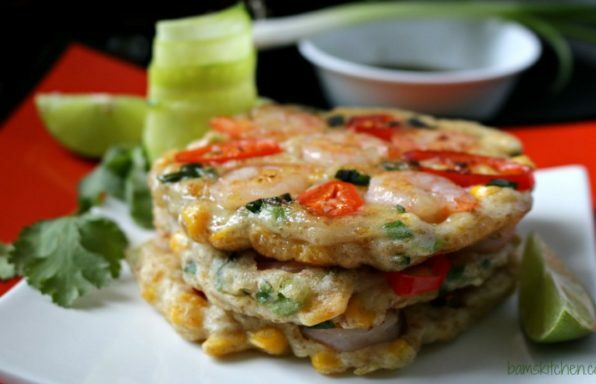 3Make your Gochuang Dipping Sauce. (optional) In a small bowl, add gochuang sauce, tamari (soy) sauce and sesame oil and mix well. Set aside. 4Grill Korean Beef BBQ Kalbi. Take your marinated beef out of the refrigerator and allow to come up to room temperature about 20 minutes. 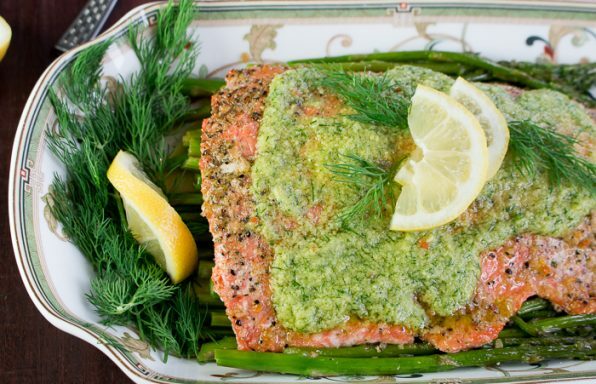 Pre-heat and prepare your outdoor grill or indoor grill pan with a little olive oil or spray oil to prevent sticking. Grill boneless short ribs for about 1-2 minutes on each side over a medium hot grill. (Do not overcook, just get quick grill marks on each side) Sprinkle your tender and delicious Korean Beef BBQ Kalbi with a little toasted sesame seeds, if desired. 5Assemble Korean Beef BBQ Kalbi party: Gather your family and friends and place the grilled Korean Beef BBQ Kalbi, lettuce leaves, quick pickles, gochuang dipping sauce, beans sprouts, kimchi, and what ever fresh vegetables you like. Take a lettuce leaf in your hand and place on a slice of grilled Korean Beef BBQ Kalbi, add the quick pickles, kimchi, fresh bean sprouts and gochuang sauce on top. Roll up like and tortilla and eat. Enjoy!